Another reaction commonly covered in the first weeks of organic chemistry is the SN1 reaction. The SN1 reaction introduces you to repetitive concepts and rules you will encounter all semester, this time focusing on carbocation formation and reactivity. In this article, we will review the important topics of an SN1 reaction. Sign up with StudyOrgo today to get detailed reaction mechanisms and explanations to prepare you to ace your next exam! One of the most reactive molecules involving substitution reactions via SN1 are 2° and 3° alkyl halides. However, there are a number of considerations to keep in mind to determine if this mechanism of substitution describes your reaction. First, let’s look at a simple SN1 reaction; a sec-butyl halide (a 2° methyl-ethyl carbon center). Carbocation formation and stability: Let’s break down the reaction name more simply. The term SN1 reaction gives you 3 pieces of information, first the ‘S’ indicating ‘substitution’, the ‘N’ denoting the reaction involves a nucleophile and ‘1’ describing the process as unimolecular – meaning only the formation of the reactive substrate intermediate determines the rate of reaction. This process is referred to as the rate determining step of the reaction, and can be thought of as the ‘bottleneck’ in the reaction. The leaving group will break the bond to carbon and take the electrons for the bond with it forming a carbocation intermediate. Halogens are good leaving groups because of the inductive effects (or electron withdrawing potential) of the halogen atom and is the characteristic of good leaving groups. Carbocation formation is the first, and rate determining step, in the reaction. Product formation and racemization: Once the leaving group bond is broken, stability of the carbocation is the factor that determines if this mechanism occurs. The more substituted the carbon center, i.e. 2° and 3°, the more stabilized the carbocation becomes as the positive charge becomes delocalized to the other carbons. Following formation of the carbocation, it will then react with the nucleophile. Since the carbocation assumes a planar shape, attack by the nucleophile can occur from either side of the plane. This leads to formation of a mixture of enantiomers, referred to as a racemic mixture. This is in contrast to SN2 which will only produce the inverted stereoisomer of the reactant. Carbocation Rearrangement: As mentioned before, stability of the carbocation is the key step in determining rate and completion of SN1 reactions. In some instances, the leaving group is bonded to a carbon center than neighbors a more substituted carbon center. Let’s consider the reaction below, chloride leaves 2-chloro-3-methylpropane to form a 2° carbocation. The neighboring carbon center is 3°, and would make a more stable carbocation. In this instance, the neighboring hydrogen will shift to the 2° carbocation to form a new 3° carbocation, which is much more stable in a process referred to as a 1,2-hydride shift. 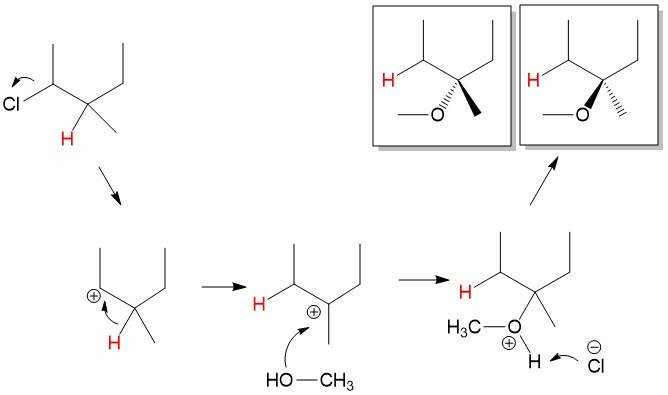 Attack of the methanol hydroxyl group on the carbocation followed by proton abstraction by chloride leads to formation of the 3-methoxy-3-methylpropane product.